The more you know about the Expat market, the more you will want to know about How To Germany. It's not often that a marketing executive finds a well-defined and lucrative consumer group. The expat market is one. It means business for you - and How To Germany is the most effective way to reach it. What's so great about this market? With over 1,000,000 consumers, the English-speaking expat population has the perfect consumer profile. Don't overlook these consumers: How To Germany can help you do business with them. The How To Germany website has been online since 1998. It is a comprehensive, popular website that contains the entire archives of How To Germany magazine as well as dozens of additional in-depth articles on other topics. Over 2 million visitors have logged on to the website in the past 12 months. Frequent updates on important topics as well as a newsletter are important features of the website. The website normally ranks in the top five of Google and other search engine results for most topics related to Germany. It's Google Page Ranking is six. Hundreds of sites link to HTG Online generating thousands of visitors. How To Germany's first digital magazine was made available for downloading in January 2013. The digital issue includes much of the important information found on the website and in the annual print publication. It includes articles, lists, charts, interactive pages as well as hyperlinks that can be used if a reader is connected to the Internet when reading the publication. A complete table of contents with jump links is included for easy reading and content browsing when off-line. There is an index of advertisers by category with jump links to the ads. The magazine is continually updated. Subscribers and website viewers are notified of updates to enable them to download and view the latest issues. The reader has a choice of formats for different devices. The publication is compatible with various e-reader applications and is also available in the popular pdf format. The size and format is especially suited for easy reading on tablet devices. Advertisers benefit by being able to select various sizes and types of ads. Ads can have embedded hyperlinks as well as other features that could include animation, slide shows or embedded video. 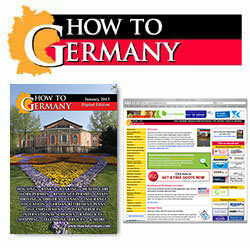 The digital magazine is available on the www.howtogermany.com website as an interactive pdf download Emails with links to the magazine download page are also sent to the 2,500+ subscribers to the How To Germany newsletter. The current issue of the How To Germany Digital Issue can be downloaded in pdf format at this link: https://www.howtogermany.com/pages/digital.html. The Newsletter will be published and sent twice a month starting in February 2019. Advertisers can sponsor the newsletter. Full and partial sponsorships are available at favorable rates.